To drive ahead the Serraj-Hafter agreement in Paris, French president Emmanuel Macron has sent his foreign minister on a day-long whistle-stop trip to Tripoli, Misrata, Benghazi and Tobruk. Jean-Yves Le Drian started in Tripoli where he met Presidency Council (PC) chief Faiez Serraj and his Libyan opposite number Mohamed Siala before going on to see State Council head Abdulrahman Sewehli. With Sewehli, the French minister was reportedly pressed on the fate of the people of Derna, besieged by the Libyan National Army (LNA) . Standing beside Le Drian, Serraj later told a press conference, that he remained committed to the Paris deal, on which he shook hands with Khalifa Hafter, for a ceasefire, early elections and a negotiated political settlement based on the Libyan Political Agreement (LPA). Serraj majored on fresh elections. “We have waited a year and a half and nothing has been achieved” he said, “except for more confrontations despite the country’s economic and security crises, so I propose the road map for the people go through the ballot boxes”. Serraj also welcomed Le Drian’s proposal to hold a Franco-Libyan economic forum in Tripoli before the end the year. The French minister had also announced the gradual return of the French embassy to Tripoli and his country’s pledge to provide €1 million to the UN-operated stabilisation fund which supports pressing reconstruction projects..
“Our objective is the stabilisation of Libya in the interests of the Libyans themselves,”said Le Drian. The French also talked to Serraj about strengthening the Libyan coastguard and southern border patrols to combat people-smugglers, an initiative in which, thus far, Italy has sought to take the lead. There has been little solid information on Le Drian’s talks in Misrata his next port of call , where he met the city’s mayor, Mohamed Eshtewi as well as local House of Representatives (HoR) members, including the influential businessman Mohamed Raied as well as Bunyan Marsous commanders. 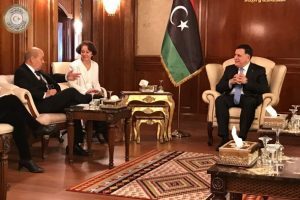 Le Drian, all the time accompanied by France’s ambassador to Libya, Brigitte Curmi, then flew on to the east where he met Khalifa Hafter in Benghazi. He later travelled on to Tobruk for his final talks of the day with House of Representatives president Ageela Saleh in Tobruk. There has been no definitive commentary on these four meetings each of which has produced the customary commitment by all parties to the Libyan Political Agreement (LPA) as the only basis for negotiations. It would seem likely that a key aim of Le Drian’s visit was to try to ensure that Sewehli and his fellow Misratans were prepared to back the Serraj-Hafter Paris agreement brokered by Macron. He will also have been urging both Serraj and Hafter to make some positive move to back up their handshake. He may even have been touting the possibility that they transform their Paris agreement into a formal signed deal. But Paris clearly recognises that the isolated Serraj administration and even Hafter in his current ascendancy, do not have the power to sign anything unless they can bring the majority of their backers along with them. As Le Drian flew back to France, he reflected on social media: “I leave this country convinced that Libyans can move quickly to get out of this crisis”.